“Bao,” the bite-sized animated film audiences see before “Incredibles 2,” was inspired by director Domee Shi’s own life as a child of immigrants. 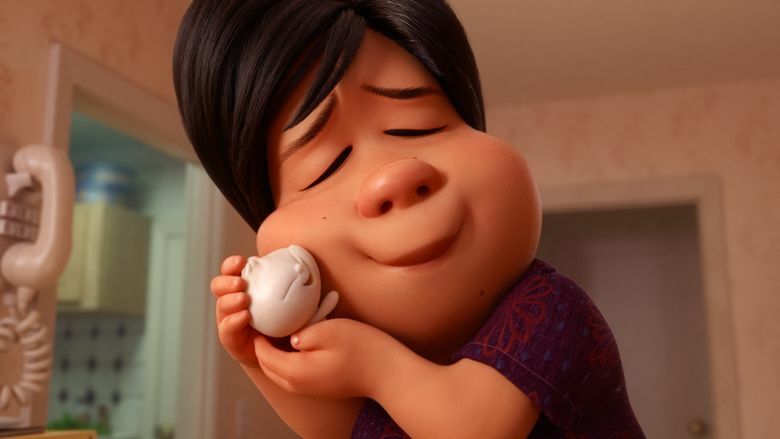 Much like a delicious dumpling before a hearty meal, “Bao” is the bite-sized animated film audiences see before “Incredibles 2.” But more than just a Pixar appetizer, the short is a whimsical love letter to mothers as well as food. It just happens to be wrapped in a package so adorable you want to eat it. Directed by Domee Shi, “Bao” centers on a Chinese mother with a case of empty-nest syndrome. She gets a second chance at motherhood when one of the dumplings she made comes to life as a tiny, giggly baby. The Chinese Canadian filmmaker took inspiration from her own life as a child of immigrants when crafting the short, a story Shi first started working on over four years ago. Shi, who joined Pixar as a story intern in 2011 before being hired as a story artist on “Inside Out,” had worked on “Bao” for almost two years on her own before bringing on more people. In a phone interview, Shi discussed her inspiration for “Bao,” overcoming her doubts to craft a specifically Chinese story and the memorable scene she almost didn’t include in the short. Q: What was your inspiration for “Bao”? A: My inspiration mainly came from my own life. Growing up I was that overprotected little dumpling for my Chinese mom. I was an only child living in Toronto with my parents, and they’ve always kind of watched over me and made sure I was safe — kept me really, really close. And I just wanted to explore that relationship between an overprotective parent and their child with a dumpling as a metaphor, as weird as that sounds. I’m also like a huge foodie, so any excuse to work with food, draw food and eat food for research was great. I definitely wanted to incorporate that into the short as well. Q: How many dumpling trips did you all go on for research? A: Oh, so many. So many dumplings were harmed in the making of this short. We took the crew on multiple trips to San Francisco and Oakland’s Chinatown. We took them to a lot of dim sum restaurants. And also Sichuan food restaurants because there are a lot of dishes in the short that the mom character makes that are actually inspired by my favorite dishes that my parents would make for me growing up. These were from the Sichuan province in China, so like really spicy mapo tofu and chili boiled fish and cucumber salad and all that stuff. We also brought my mom in twice to do dumpling-making classes for the whole crew. That was really fun research because we actually filmed her hands kneading the dough and making the wrappers, and that was used as reference for the opening shots of the short. Q: What was it like for you to step away from that “dumpling” role in order to see the mother’s side of the story? A: I love using film and stories to step outside of my own point of view and my own perspective so it was really interesting to tell this story from the mother’s point of view because I never knew what it was like on the other side. I was always so frustrated about being so coddled and overprotected and smothered by my mom. I never really understood why she did it. So making this short and really taking the opportunity to put myself in this mom character’s shoes — to talk to my mom, to talk to different parents and kids of overprotective parents throughout the process — it was really insightful and really cool to be able to learn that perspective. Q: Were there any specific Chinese cultural details you knew had to be included in a particular way from the beginning? A: All of the little props and things around the Chinese mom’s house I wanted to get into the short. Our production designer Rona Liu is Chinese American, so that was really helpful because she was also able to keep track of those little cultural details as well. Q: What was your mom’s review of the film? A: She’s now seen [“Bao”] probably like eight times. She likes it. She says she enjoys something new every time she watches it.